Whether you are on the go or in the comfort of your own home, the NISSI & JIREH 5-in-1 Soother is Five baby essentials in one. This innovative and versatile baby accessory combines the functions of a Pacifier Holder, Teether, Storage/Travel Case, and a Visually Stimulating Plush Soother. It comes with a Pacifier Clip! Completely, BPA free, the NISSI & JIREH 5-in-1 Soother is FDA, CPSIA, and ASTM tested and approved. Intended for babies of all ages, the teether element is 100% food grade silicone and the plush element is made of polyester. It comes with a Pacifier Clip. Conveniently located at the nose of the adorable plush animal, the 100% food grade silicone pacifier holder is universally sized, designed to fit any pacifier. 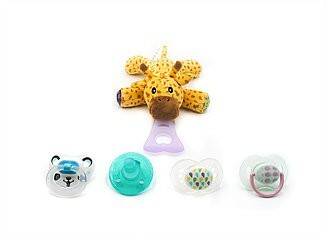 This feature allows baby to keep their pacifier nearby and in a comfortable position. The pacifier holding element of the NISSI & JIREH 5-in-1 Soother doubles as a pain relieving teether. Formed of 100% food grade silicone, the teether offers just the right amount of resistance and features a texturized element intended to soothe sore gums. Unzip the plush to reveal a small storage pacifier pocket. Designed as an easy way to keep a spare pacifier germ-free and accessible, it is especially beneficial when traveling or running errands with baby. NISSI & JIREH 5-in-1 Soother’s animal design is the result of extensive and thorough research. The red, black, white, and multiple color contrasting print on the ears and paws of the plush encourage both visual and brain development, as these particular colors stimulate retina to brain connection.